ATLANTA (AP) Zack Godley’s control was sharp. 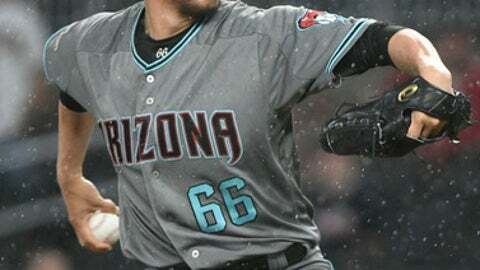 That usually means good things for the Arizona Diamondbacks. Both teams began the week in first place but have since fallen out. The Diamondbacks began the night a half game behind the Dodgers in the NL West. The Braves, who have lost seven of their last nine, fell 1 1/2 games behind NL East-leading Philadelphia. Godley (11-6) gave up three hits in the first, including Kurt Suzuki’s run-scoring single. He allowed only two hits over the next five innings and struck out seven overall. Godley issued only one walk. Arizona is 10-2 when the right-hander walks no more than three batters. He said he took advantage of Braves batters swinging early in counts. Brad Boxberger struck out the side in the ninth for his 23rd save. Braves right-hander Anibal Sanchez also was sharp, allowing a run and five hits in six innings. The right-hander gave up his run in the sixth, when Alex Avila doubled to left and scored from third on Jon Jay’s blooper into shallow left field. Jay moved to third on a hit-and-run single by Paul Goldschmidt but was thrown out at the plate by first baseman Freddie Freeman on David Peralta’s grounder. Sanchez was pulled after throwing 86 pitches . He has thrown 90 or more pitches in five games this season. Arizona quickly took the lead against the bullpen in the seventh. Daniel Descalso drew a one-out walk from Sam Freeman (2-5) and scored on Ahmed’s single up the middle off Dan Winkler. Diamondbacks: An MRI on RHP Shelby Miller (right elbow inflammation) will be examined by Dr. Neal ElAttrache, who performed Miller’s Tommy John surgery last year. Manager Torey Lovullo said team physicians have examined the results but want ElAttrache to provide an additional opinion. Miller left Wednesday’s 19-2 loss to Colorado with tightness in the elbow after giving up five runs in the first inning. Braves: LHP Luiz Gohara is schedule to make two starts with Triple-A Gwinnett before he returns to Atlanta. He’ll be on schedule to start on July 24 against Miami. Gohara was optioned to Gwinnett on Thursday, and OF Preston Tucker was recalled on Friday in a corresponding move. Running with his back to the infield, Braves shortstop Dansby Swanson made an over-the-shoulder catch of A.J. Pollock’s popup to shallow center field in the ninth. Steven Souza Jr. led off the third with a double to left field but, with the help of a video review, was picked off second by Sanchez. The review showed the tag by Swanson before Souza returned to the bag. Braves hitters were 1 for 9 with runners in scoring position. They stranded runners at third base in the second and fifth innings. Manager Brian Snitker said he’d be more likely to juggle his lineup if only one or two hitters were slumping. Many fans in the SunTrust Park record crowd of 42,130 left their seats when rain began in the sixth, but the only delays were for the grounds crew to add dry dirt to the mound. Diamondbacks: RHP Zack Greinke (9-5, 3.39) is 3-1 with a 2.94 ERA in eight career starts against Atlanta. Braves: LHP Sean Newcomb (7-4, 3.44) has allowed five runs in each of his last two starts, both losses.